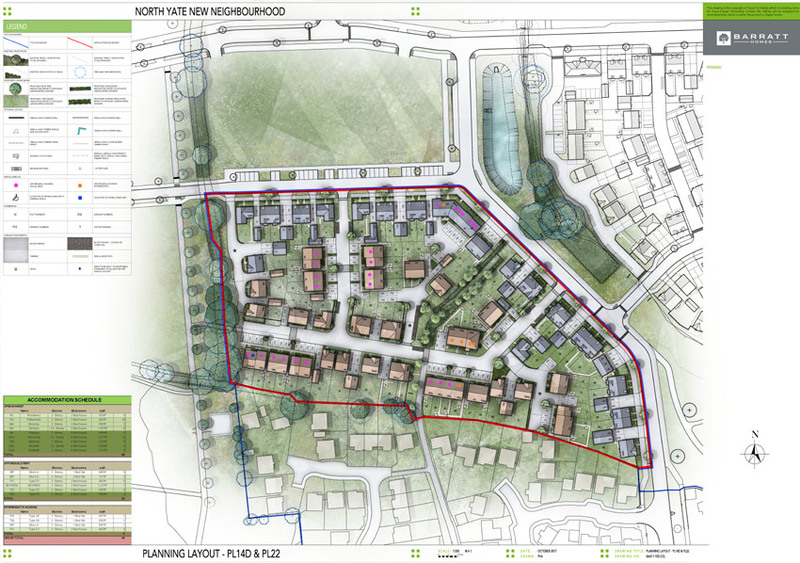 An outline application was submitted in 2012 by Heron Land Developments for the development of the site known as Land North Of Brimsham Park, Yate, for “Mixed use development across 100.76 hectares of land comprising up to 2,450 new dwellings (Use Class C3), extra care housing (Use Class C2), 4.63 hectares of employment land (Use Class B1,B2) provision of a local centre, two primary schools, together with the supporting infrastructure and facilities including: new vehicular and pedestrian accesses, public open space and landscaping and proposal to underground the electricity powerlines. Outline application including access with all other matters reserved.” The application was subsequently approved in 2015 and Barratt Homes Bristol acquired the site in 2016. The first residential reserved matters application was submitted to South Gloucestershire Council in December 2017 for 86 dwellings, under reference PK17/5389/RM , the application was considered at the planning committee and permission was granted on 21st November for both Barratt and DWH phase 1 residential parcels. Application for Phase 2 parcel has been submitted to South Glos Council in April 2018. The application is for 222 units and are awaiting comments from the Council. Barratt Homes Bristol have acquired the site known as North Yate New Neighbourhood which has Outline Planning Permission for up to 2,450 dwellings under application reference PK12/1913/O. The site is positioned immediately north of the existing urban edge of Yate at Brimsham Park. The site is bordered by existing properties to the south, a railway line to the west, Tanhouse Lane to the north and field boundaries to the east. The overall scheme will deliver 35% affordable housing for the area, as well as facilities such as a local centre, employment land, play areas, sports pitches and a primary school. 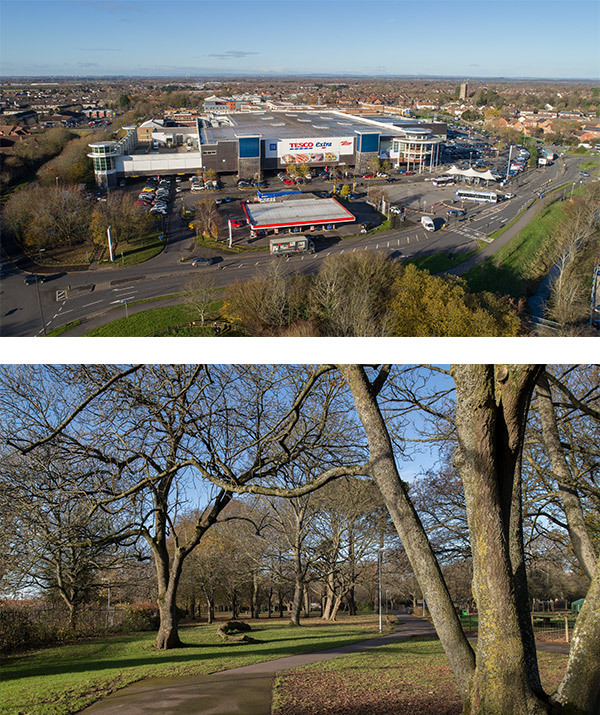 The site will feature many public open spaces with recreational play areas whilst also retaining existing trees and hedgerows which are incorporated into the scheme. Forming part of the outline application, a design code was agreed and approved which illustrates certain styles and materials as well as character areas for the scheme which Barratt have to adhere to. The size of the development means it is split into phases, with the first reserved matters application in the first phase submitted in late 2017. Further reserved matters applications will follow in 2018. The first residential reserved matters application was submitted to South Gloucestershire Council in December 2017 for 86 dwellings, under reference PK17/5389/RM. The application is being considered by the council and is awaiting a decision. Barratt Homes look forward to submitting further reserved matters applications in 2018. The Reserved Matters Application for phase two was approved by the Strategic Sites Delivery Committee on 10th January 2019 for 226 dwellings.